It seems hard to believe that we have already passed the one-month check ins as part of the clinical trial last month. Some days, it seems like it’s been so long since we have been to New Jersey, and other times, it feels like we just started the trial. But one month has already come and gone. After the first 30 days, we switched from two tablets twice a day to one tablet three times a day. Grace can’t swallow tablets, so we pierce them and squirt the liquid into her mouth. And I’m happy to report only one injury when Kyle poked himself in the hand trying to get it open. We consider that a win. Also part of the clinical trial, we have to make a set of four two-minute videos and submit them to the study. They include feeding, interacting, bathing and sitting/standing/walking. Although it’s kind of a challenge to do the videos, mostly from a logistics point (two-minute videos take up a lot of space on my phone! ), I think it will be a great way to track progress in the study. 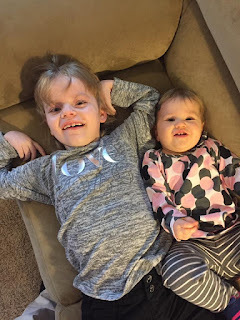 Shortly after Grace started taking the study drug, we noticed more vocalizations, more smiles, more alertness and some trying to move her arms. That was very similar to what other families in the study were seeing, and although those are very small things, we consider them big wins in our household, especially the smiles. But I did notice another improvement when I made one of the one-month check in videos. Although Grace cannot sit, stand or walk on her own, you have to document that in a video. So, I sat her right in the middle of our loveseat, where her back was supported, but not the kind of support she is provided in her wheelchair. We’ve propped her up there in the past for photos, and I honestly expected she would immediately topple over to one side or the other, which is still probably important to document. 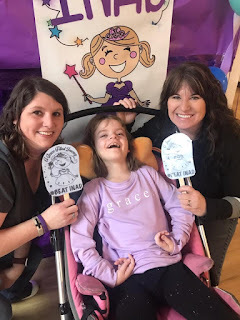 However, much to my surprise, Grace sat up for the entire two-minute video, moving her arms and her head just a little as well. She tipped over just after the two-minute mark, and I have to say I was completely shocked. It’s nearly impossible to know if that’s an effect of the drug or just a good day for Grace, but I will always take small victories. We are especially grateful to everyone who has supported us on our journey with the clinical trial this year. From those who have provided financial contributions for travel or other resources in helping us figure out exactly what we are trying to do, we feel truly blessed. You guys make life great on this Grace-Filled Journey, and I can’t wait to see what improvements the next video might show. 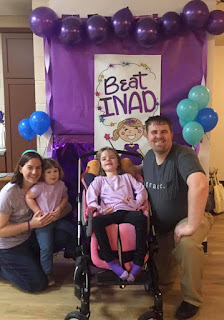 And while we know this isn’t a cure for INAD, and likely won’t restore Grace’s health completely, we have already seen improvements in her quality of life, which is an awesome win for our family in the fight to #BeatINAD. Thank you for being a friend. 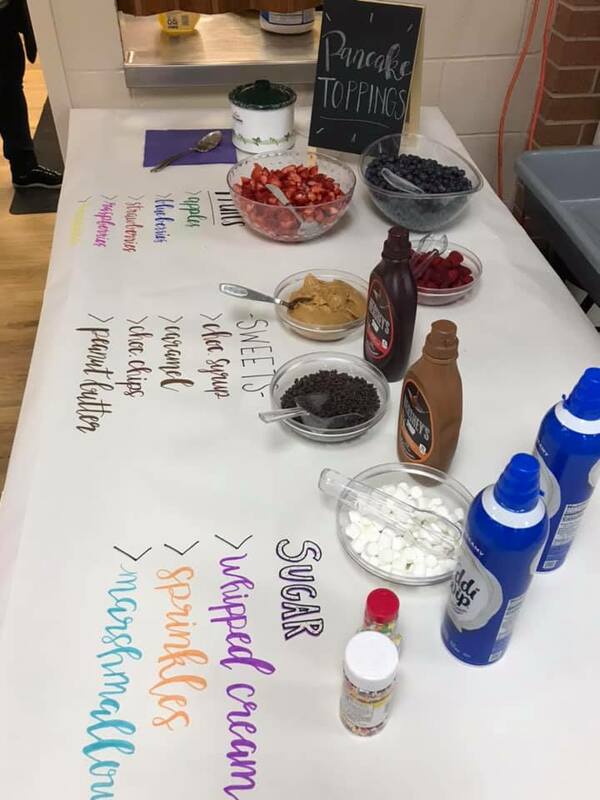 Every time I have stopped to think about our church’s pancake fundraiser, I can’t help but think of the theme song from the Golden Girls. And I keep singing it over and over again in my head, because we really, truly are blessed to have such amazing friends. Family photo at the pancake and sausage benefit. Some of the decorations in the church fellowship hall. One of our favorite photos of Gracie Lou! 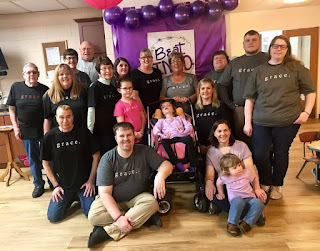 Each year, our church hosts a pancake and sausage breakfast as a fundraiser for someone in the community, and this year, they asked if they could host it for us to help offset the travel costs of taking Grace to the clinical trial in New Jersey. Although sometimes it’s hard to be accepting of such generous thoughts and gifts, we agreed, mostly because it is a HUGE help to us in paying for the travel expenses, which add up fast, even when you’re frugal! 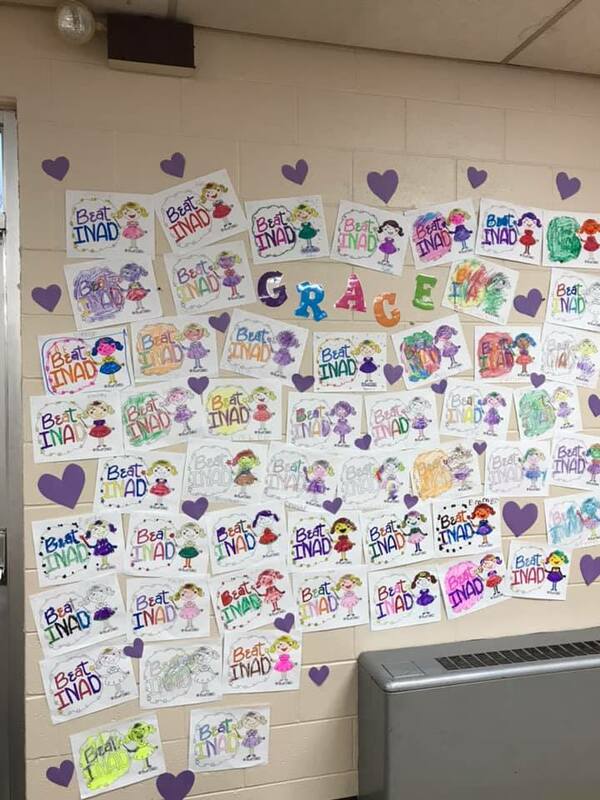 Grace's friends colored Beat INAD pictures for the wall. Not that we arrived when it started first thing in the morning, but the church’s fellowship hall was absolutely beautiful. 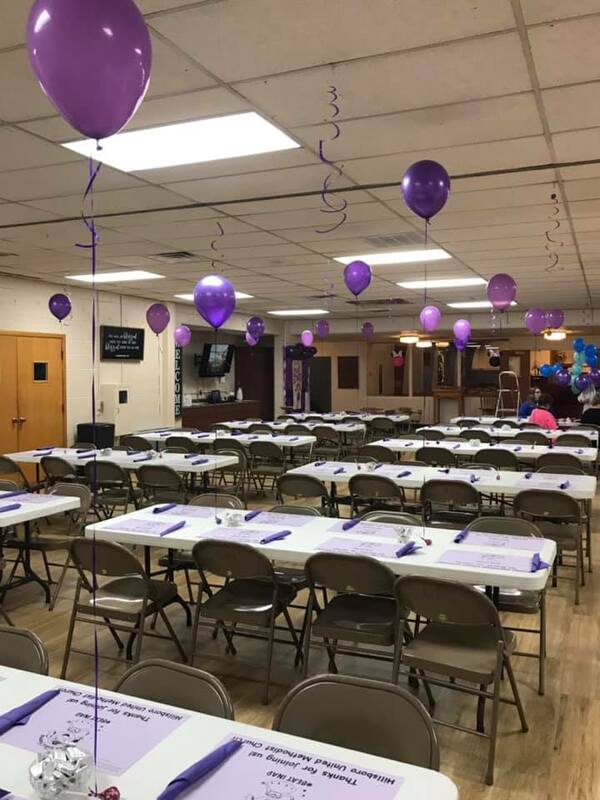 They had purple balloons on every table, and special Grace-Filled Journey placemats. Kids in the church’s preschool program and Grace’s kindergarten class colored Beat INAD pictures that hung on the wall in one corner of the room. 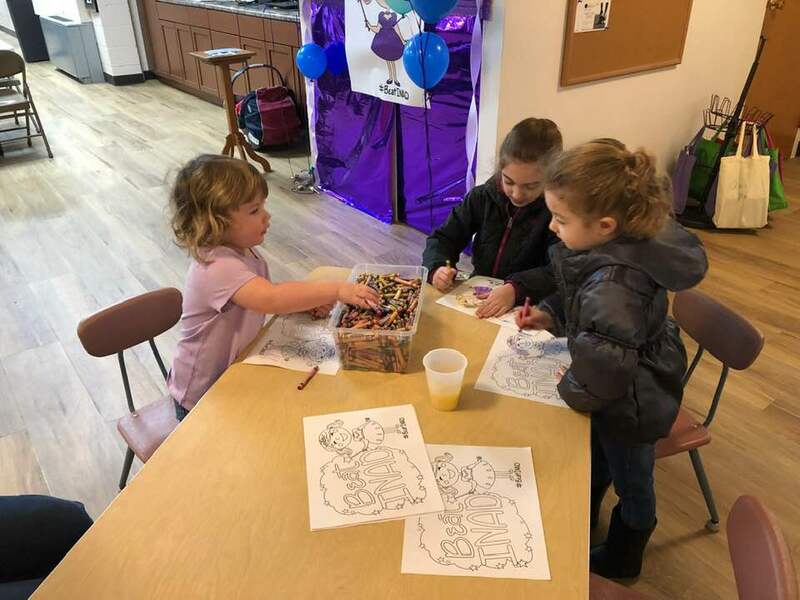 They even set up a special coloring table where kids attending the breakfast could color their own pictures and hang them on the wall. We especially liked a photo booth type station where kids and families could get their photo taken with Flat Gracie. Charlotte and her Mickey Mouse pancake. I just happened to check Facebook when I was getting ready in the morning, and some of our friends had already been to breakfast and had tagged us in photos. It was so much fun to see them enjoying themselves and a really special community event. Volunteers from the church wearing new Grace shirts. Although breakfast was served starting at 7, I would say we arrived sometime after 9:30. It takes a little while to feed Grace in the morning, and most anyone that knows us, knows we don’t see 7 a.m. very often! Since it was raining, Kyle let me and the girls out underneath the awning and some of her former classmates were already waiting to see her. She had big smiles when Hazel and Kendall came over to say hello. And we enjoyed visiting with all those who came while we were there. 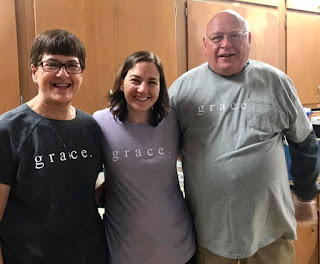 Grace and her friends Tim and Kris Carpenter. Grace and some of her friends at the breakfast! I have to say the food was fantastic as well. We loved the pancakes and sausage, and Charlotte even got a Mickey Mouse pancake that they made special for the kids who came. I think her dad ended up eating most of it though, as there was WAY too much going on for Charlotte to care anything about eating. Kinsley Trader saved $100 of her own money from working to give to Grace. One especially touching moment was when Kinsley Trader, a junior high student in Hillsboro, brought Grace the money she had herself saved to donate. 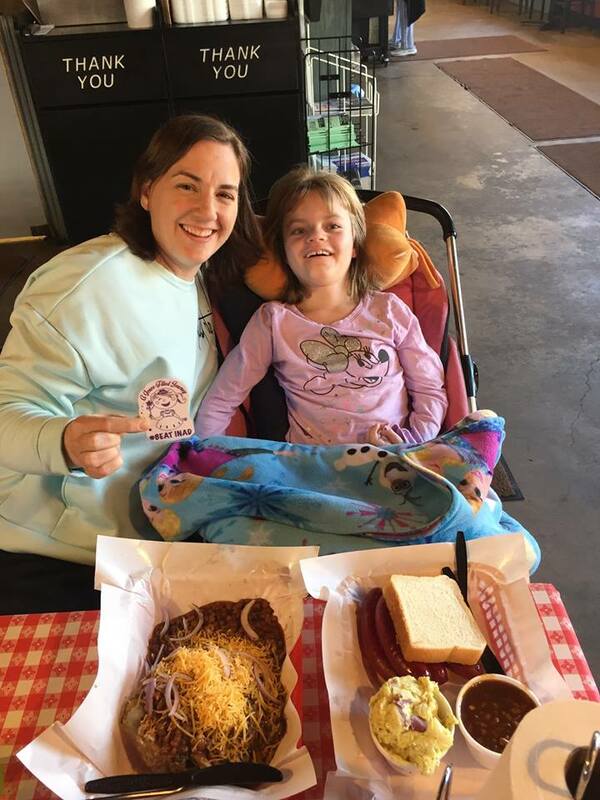 She had been working hard in her Uncle Matt and Aunt Alora's food truck and wanted to save her money to donate. 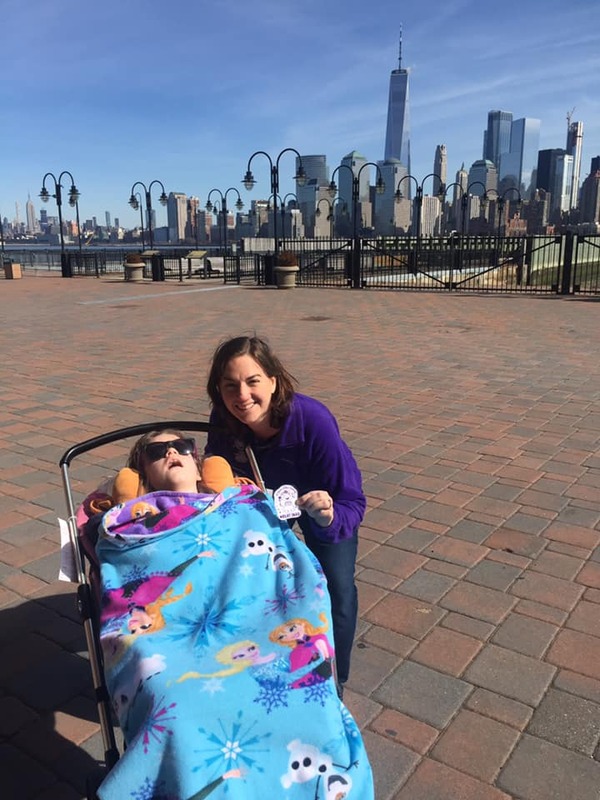 Her mom told me she made a thermometer chart so she could keep track of her goal to raise $100. How amazing is that!! Hanging out with my mom and dad. After we ate, we just enjoyed chatting with our friends who came from all over the county to support us. Some came over to the table to get their picture taken with Grace. Others enjoyed visiting while Charley and I mingled around the room. But that entire morning, I just had such an overwhelming feeling of gratitude for everyone. From those who came early to set up and cook, to those who served and cleaned up, and of course, all those who came to eat, we feel truly blessed. Charley coloring pictures with Dahlia and Demi Maass. They announced in church the following morning that the breakfast raised about $5,700. Wow! Can you believe that?! We were so humbled, and that money will definitely help us offset the travel expenses we incurred in our first two trips out east, and we will save the rest for our return trip in August. Grace's friends Lucy and Frankie in the photo booth. So, to everyone who helped out that morning and to everyone who continues to follow our story and help us raise awareness for INAD, thank you for being a friend. Team Grace: Because some of the best athletes know that it’s always about more than just a game. Over the past five years, countless teams have shared in our Grace-Filled Journey and invited Grace to be part of their team. From local junior high and high school teams, club teams, college teams, and even one Major League Baseball pitcher, we feel pretty blessed for the opportunity to raise awareness through sports. The Lady Hiltoppers gave Grace one of their state medals. In the past week alone, four teams have found a way to recognize Grace through their efforts. And that’s just the past seven days. It started at the Orlando International Airport. I happened to be wearing one of the t-shirts from the Grace-Filled volleyball tournament last year, and two girls in line asked me if I was a volleyball player. After Kyle stopped laughing hysterically at their question, we had the chance to tell them about Grace. 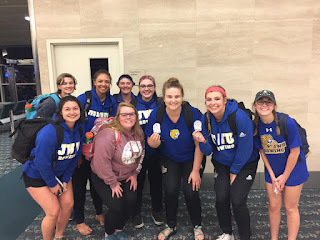 Turns out, they were part of a women’s rowing team at Johnson and Wales University in Rhode Island and they had a spring camp down in Florida. They wanted to know more about our story, so we shared a Flat Gracie with them and told them about our blog. We even managed to take a photo in the airport before we went our separate ways. Members of the Johnson and Wales University women's rowing team and Flat Gracie. 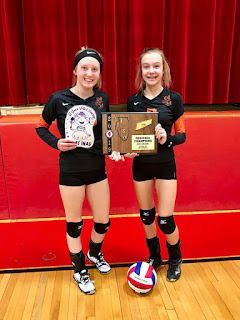 When we returned home, we took the girls to the IESA seventh grade volleyball sectionals in Nokomis. Kyle’s cousin is a member of the team, and we went to cheer them on. When the team won regionals the week before, they posed with Flat Gracie for their team trophy photo. It was a fun game to watch, and we even had a connection to the opposing team, who also wanted to get her photo taken with Flat Gracie. 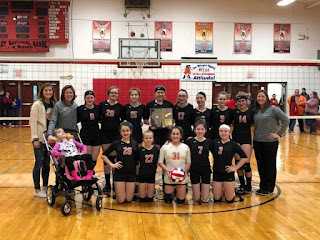 When it came time for the team photo with the sectional trophy, the Lincolnwood coach came over and asked if Grace could be in it, as part of the team. 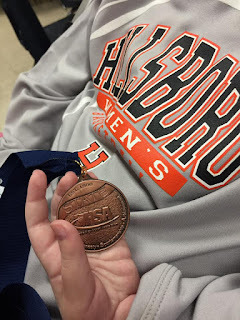 The very next night, we had been invited to bring the girls to the Hillsboro High School girls basketball season banquet. Coach Tuetken had texted Kyle the week before that the senior girls wanted to give Grace one of their state medals. After the meal, the five senior players got up to present a medal to Grace (who slept through the whole thing!) Senior MVP Sammi Matoush thanked Grace for being a special part of the Lady Toppers’ journey and for allowing the team to be part of hers. This momma might have cried just a little bit. I’m so grateful for such amazing young people with big hearts and a beautiful little girl, who shows the world what it means to be courageous each and every day. 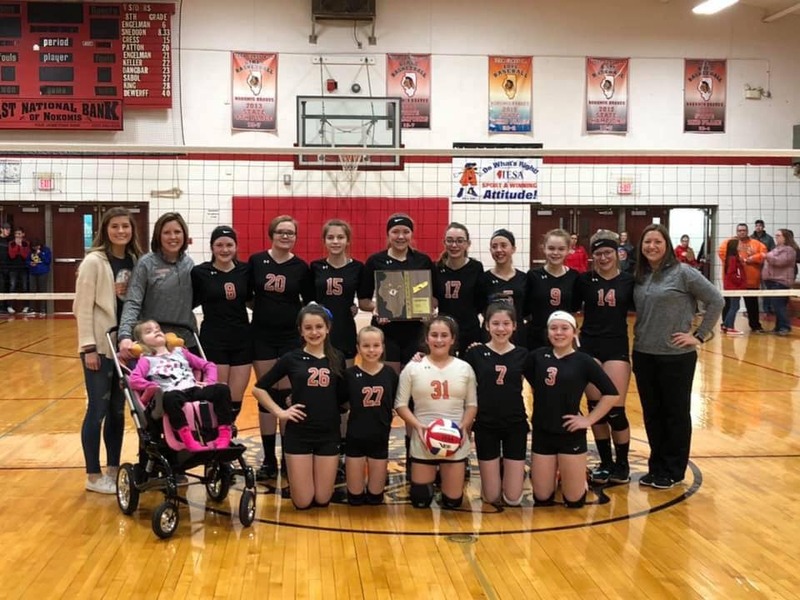 Grace with the sectional champion Lady Knights volleyball team! 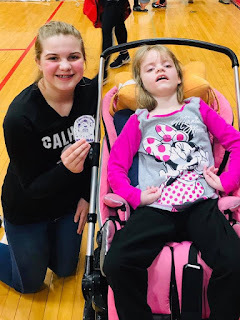 And before the week was done, we received a message from Kenny Lauderdale, a men’s soccer player at Rockford University (and an alum of the Grace Cup), inquiring about a Flat Gracie to take back to school and take a photo with his team. They want to be part of the journey too. And like I said before, that’s just one week. There have been so many special teams and great athletes over the past five years. 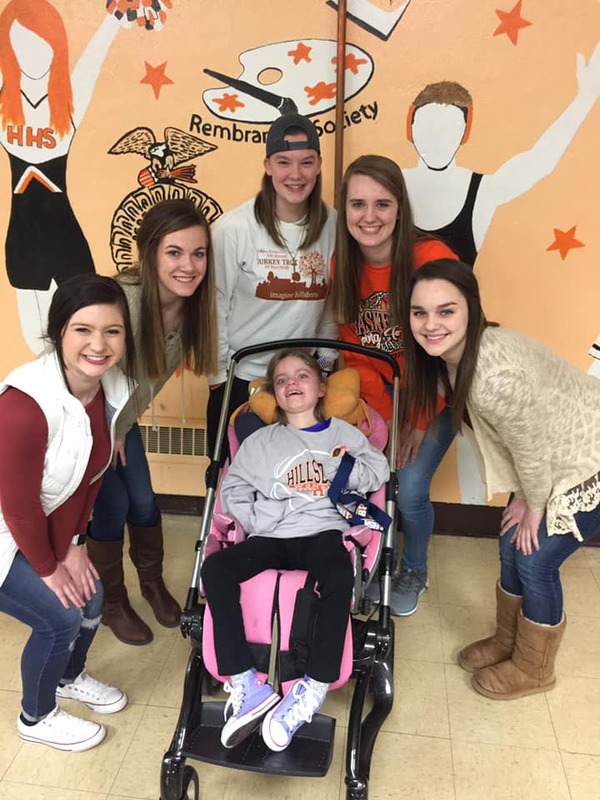 And we have tried to take Grace to as many games as we can, so she can be a part of all these amazing events. Grace hanging out with Mary, who played on the Hardin-Calhoun seventh grade team. 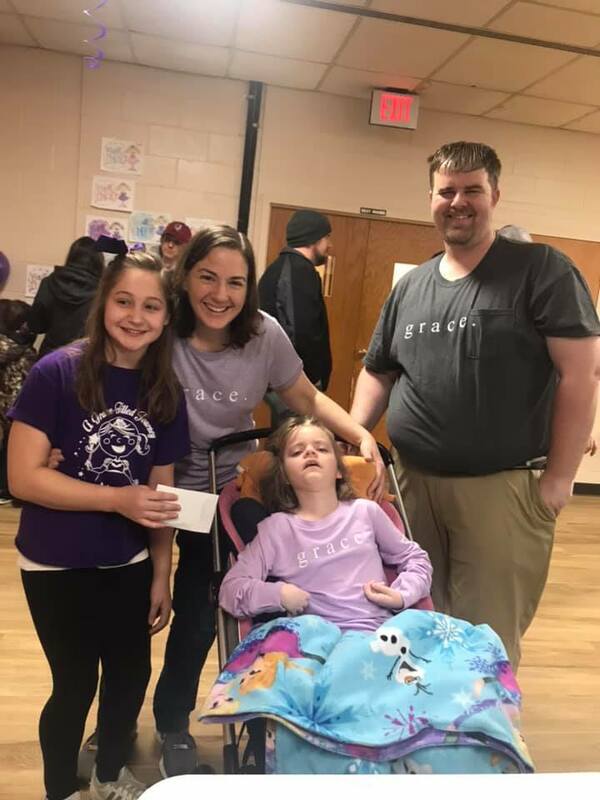 Earlier this year, we got a letter from one of our favorite Team Grace members. She talked about what she had learned being part of this Grace-Filled Journey and why she wears her gracelet all the time. Even though she can’t wear it when she plays, she wrote that she put it on her water bottle to help her remember that it was just a game, and that she’s blessed to have the opportunity to play, something that’s truly not guaranteed for everyone. 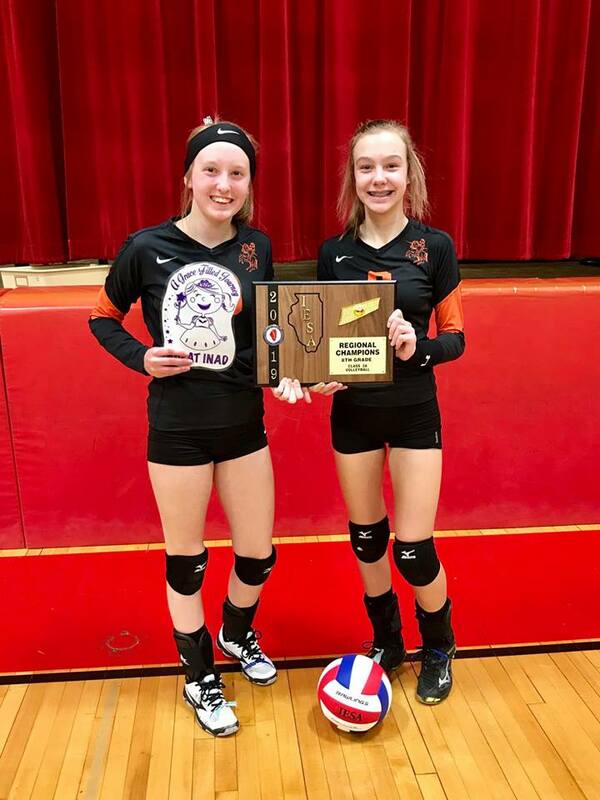 Lincolnwood Lady Knights eighth graders and Flat Gracie. 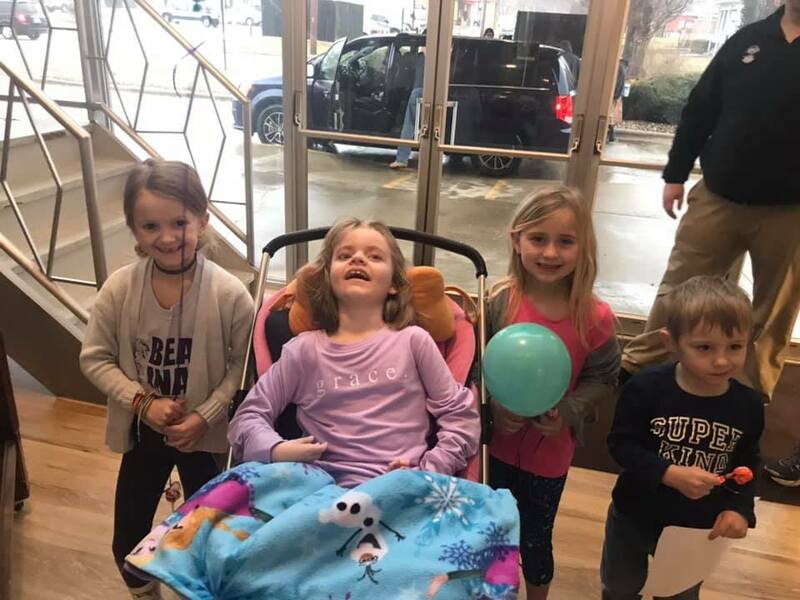 We know that it’s highly unlikely Grace will ever kick a soccer ball, score the winning basket or run the one-mile race, but in her short seven years, she has already taught so many of us about the things that really matter in life. It’s fun to play, and even more fun to win. But at the end of the day, it’s always still just a game. And the things that matter most are the players who take some of these lessons to heart. No matter the mascot or the team colors, all the players on Team Grace will always be the biggest winners in our book! If you’re anything like me, you’re already thinking about your next meal and and how you’re going to get away with not cooking it. Well, on Saturday morning, we have a great plan already set in motion for you! Our church family at the Hillsboro United Methodist Church (537 Rountree St.) is hosting its annual pancake and sausage breakfast as a benefit for Grace and to help our family offset the costs of taking her to New Jersey for the first-ever clinical trial. 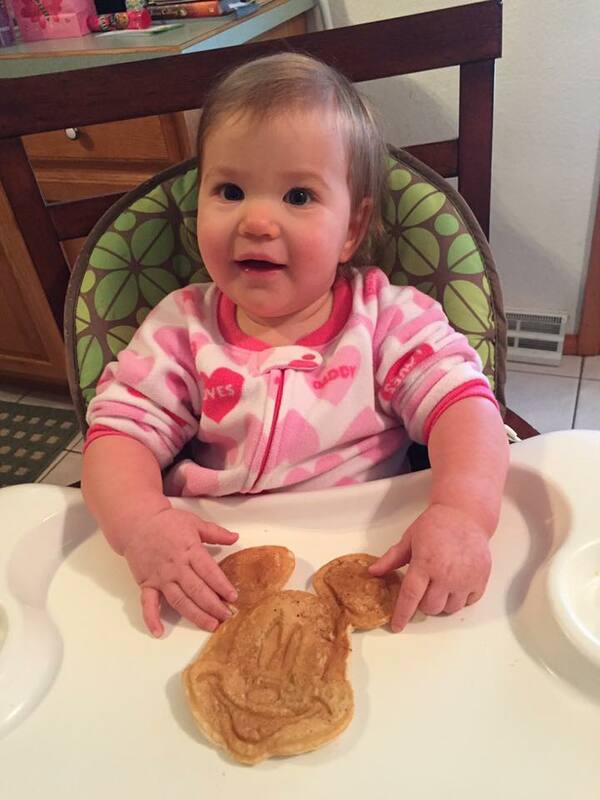 Charlotte loved her Mickey Mouse pancake last year. Before I get too far along, here’s the details on how you can participate. Church volunteers will be serving pancakes and sausage in the fellowship hall from 7 a.m. to noon on Saturday, March 9. Donations will be accepted for the meal. And I’ve heard there will even be Mickey Mouse pancakes for the kiddos! We feel so blessed that our church family has offered to help us out this year. 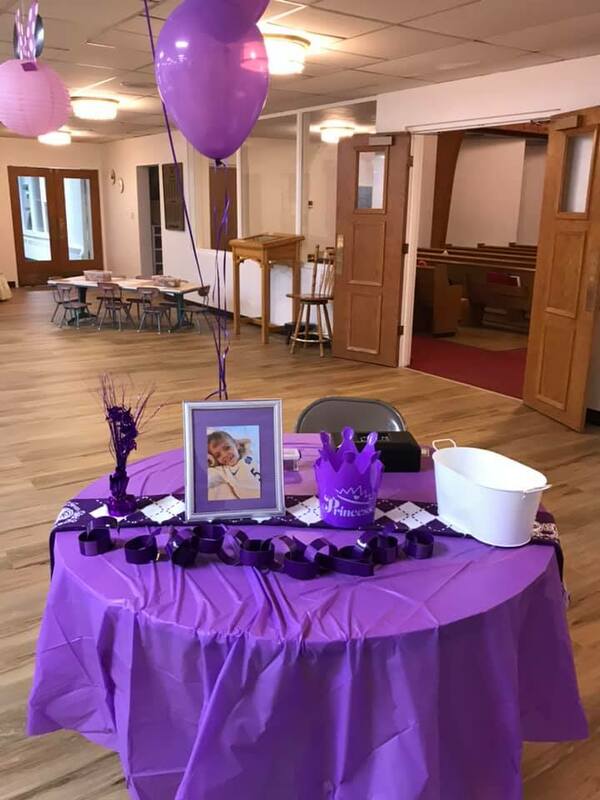 For many years now, our church has hosted this breakfast and raised funds for local families or groups. 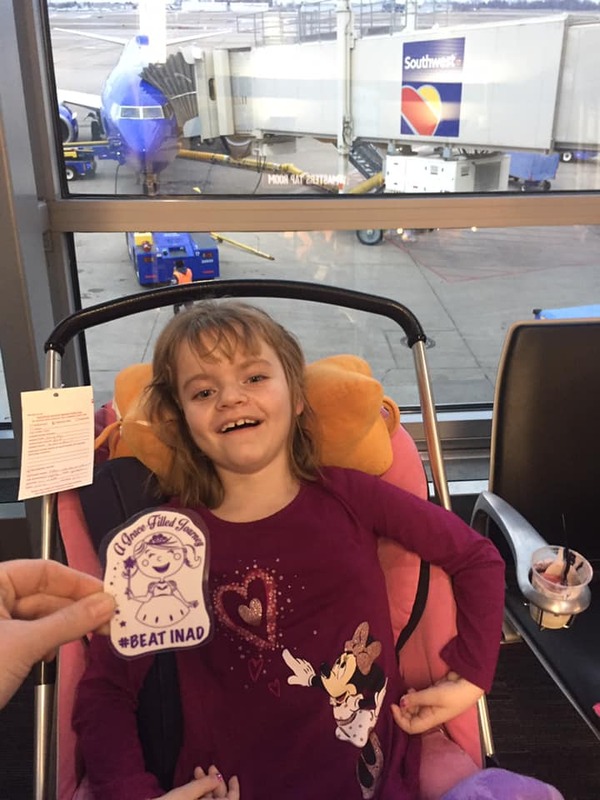 This year, organizers knew we would have added expenses in taking Grace to New Jersey so she could be part of the clinical trial. This year, we will have three trips out east and one next February at the completion of the trial. The trial itself is free for Grace to participate in. We don’t have to pay for any of the medicine or any of the testing or appointments that go with it. However, we do have to pay for the travel to get out there, which has included gas, hotel stays, airfare and meals. We try to be pretty thrifty when we can, but this benefit will definitely help us out in making sure we have everything covered. 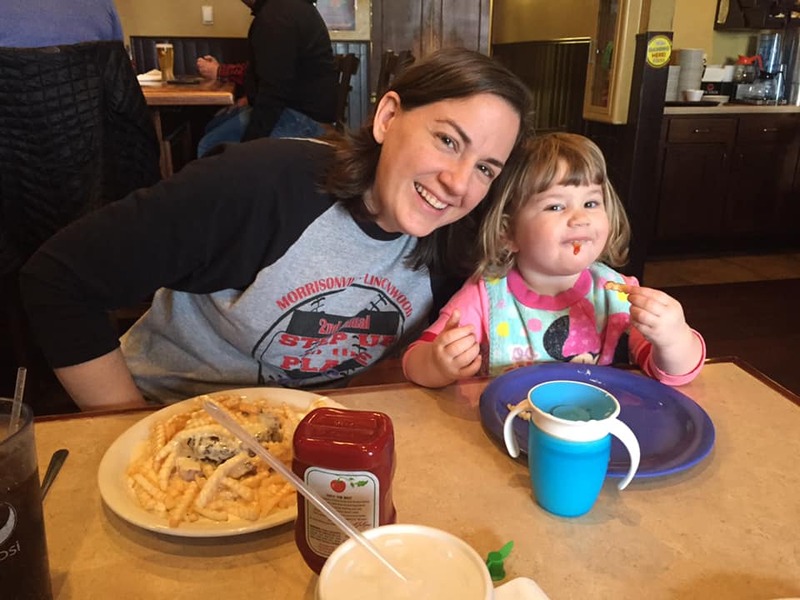 Since having kids, it’s gotten harder for us to volunteer, but we always try to make it to eat there and support our church and the community they are helping that particular year. Last year, it fell on the same day as Charlotte’s first birthday party, so we didn’t get to eat there, but we managed to get a to-go order and eat at home. 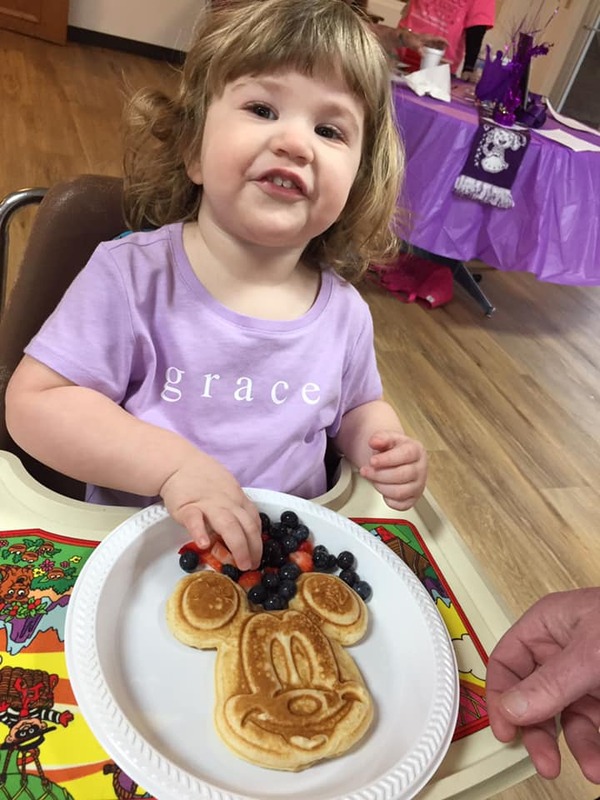 She was thrilled with her Mickey Mouse pancake, and I’m sure she will love it just as much this year! Our family is planning to be there that morning to enjoy some awesome breakfast and say thanks to everyone who continues to support us on our Grace-Filled Journey. You probably won’t find us there when it starts at 7 a.m., but we look forward to being there. We hope to see you there too! 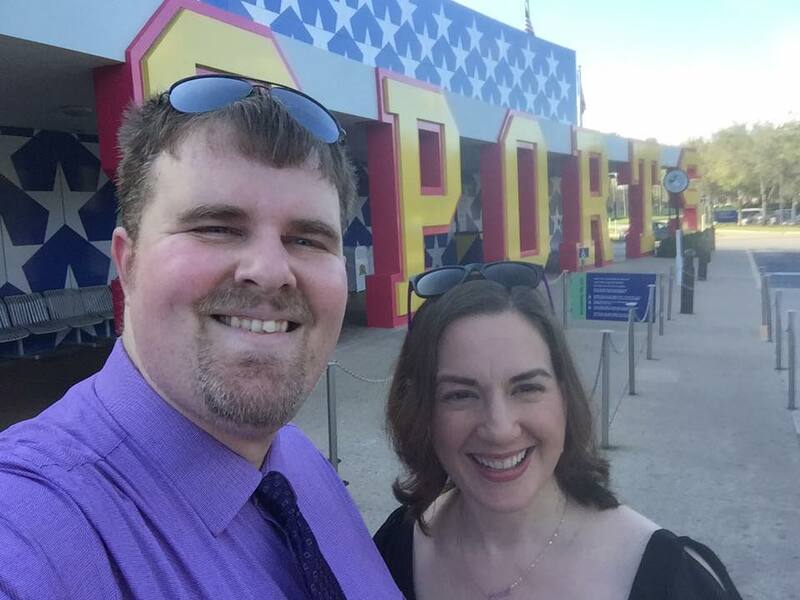 As we rode into Walt Disney World last Thursday, I told Kyle it was just about the same time that we were getting married ten years earlier. 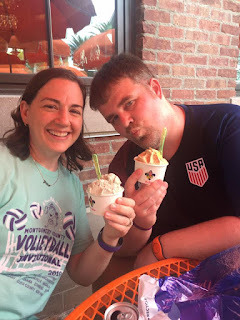 In some ways, it seems hard to believe we’ve been married for ten years, while other times, it’s hard to remember a time that we weren’t together. This year, we celebrated with a three-day trip to Orlando, FL, to visit the Wizarding World of Harry Potter at Universal Studios. We started talking about taking a trip to celebrate sometime last year, and it seems like we talked about a million places. Kyle lobbied for New York City in the beginning because he wanted to take me to see a show on Broadway. But ultimately, we decided that Universal Studios was the perfect place to mark ten years together. And thanks to our friend, Laura Wagahoff at It’s a Small World Adventures by Laura, it was perfect. 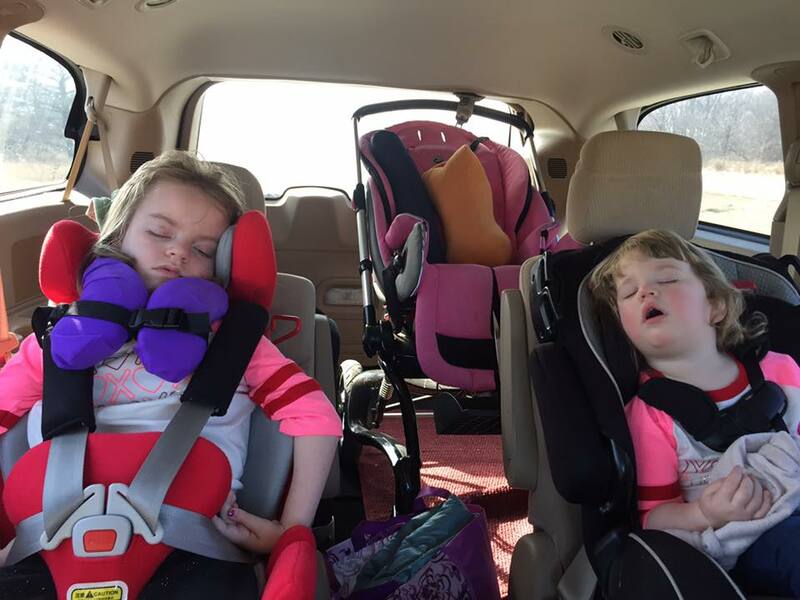 Extra special thanks to Grandma and Grandpa Galer for keeping the girls so we could enjoy a weekend getaway. All dressed up to celebrate our tenth anniversary. Laura did all the booking for us, and somehow, we’ll say that old Disney magic, everywhere we went, people knew it was our anniversary. We got purple and orange Happy Anniversary balloons (to match our Magic Bands) when we checked into the hotel, along with a photo signed by Mickey and his crew. The hotel manager even left a card on our bed with a chocolate treat in celebration of our anniversary. I would definitely say we felt spoiled the entire time we were there. 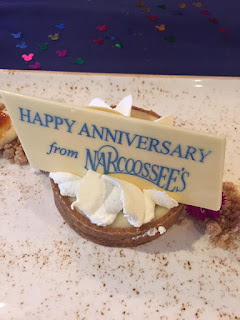 Although we stayed on Disney property, we hadn’t really planned on visiting any of the Disney Parks, so Laura found us a romantic restaurant called Cafe Narcoosee’s at the Grand Floridian to celebrate on our anniversary. 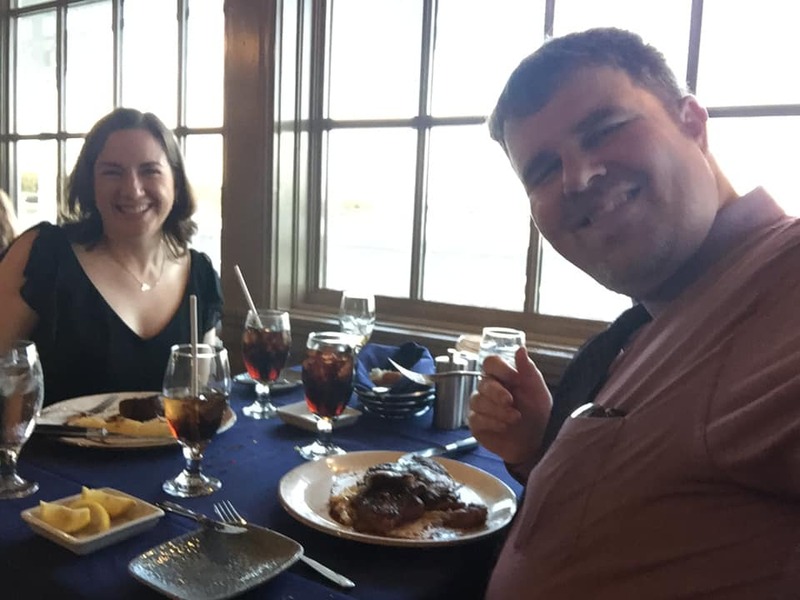 We took a bus from our hotel to the Magic Kingdom, and then Kyle suggested a boat ride across the lagoon to get to the restaurant. Our table was right on the water and the food was amazing. We capped off the evening watching the fireworks at the Magic Kingdom. 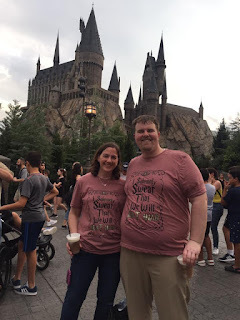 Visiting the Wizarding World of Harry Potter. We spent the next day wandering around two parks at Universal Studios. 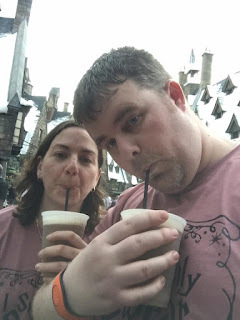 And from the “caraoke” on our first Uber ride to the butterbeer at the Leaky Cauldron, the day was nearly perfect. We enjoyed walking around all the Harry Potter sights and doing some shopping. And even though we were way too chicken to ride the Harry Potter roller coasters, we found a few rides in the Dr. Seuss section that were more our speed. I even beat Kyle at air hockey in the arcade. To end our day, we found an Italian restaurant just outside Universal that reminded us of our honeymoon to Italy. Drinking butterbeer at Universal Studios. All too soon, it was the final day of our trip. We slept in and enjoyed some time at Disney Springs. Lunch at Frontera by Rick Bayless was one of the best meals of our trip, and of course, we did way too much shopping for the girls again. Before we left, we stopped for some gelato, which also reminded us of our time in Italy ten years ago, and a visit with one of my high school friends. Throughout the weekend, Kyle and I talked about other anniversary celebrations. We moved into our new house the day before our first anniversary, so that one was extra special to us, celebrating in our first home. My mom brought over dinner, and we dined by candlelight before eating some not-so-delicious year-old wedding cake. I’m not sure who started that tradition, but I think it’s one we could live without! 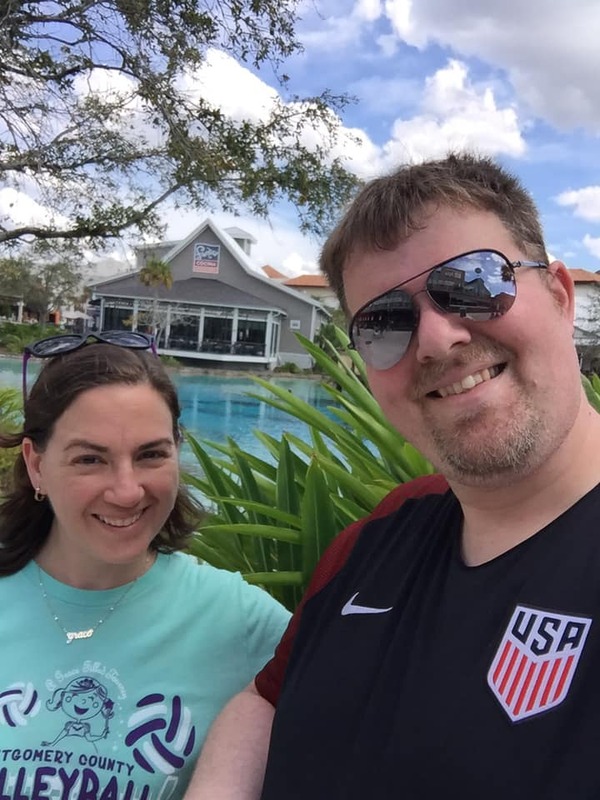 Lunch at Disney Springs on the last day of our trip. Other years are fuzzy. TimeHop reminded me that Kyle made me breakfast in bed of French toast a couple of years. And we love to eat out at the former Church Street Pub and Canton Inn. We’ve taken a couple other trips to celebrate over the years, just not on our anniversary date. We spent one cold weekend in Madison, WI, to see the Avett Brothers, and another warmer weekend in July to see the same band at Red Rocks in Colorado. It’s kind of funny that we had trouble remembering what we did on our anniversary the previous nine years. And we didn’t always celebrate on the exact day. But we always make time to celebrate both our love and our marriage. Having some Italian gelato before heading home. 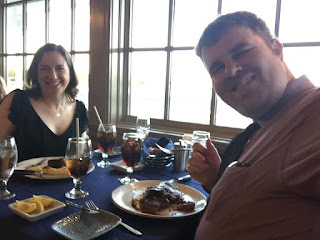 When we returned to our hotel room after dinner at the Grand Floridian, we watched a video of our wedding highlights on Facebook posted by Video Edited Memories. The video included our vows, “in good times and bad, for richer, for poorer, in sickness and in health.” I can’t say that when anyone ever gets married they feel like there will be bad times. I just remember being so incredibly happy that day, thinking that marriage would be like all those romantic comedies I watched all those years. Marriage is definitely not the simple “happily ever after” portrayed in all those movies. Marriage means compromise (which is always hard). It means being there for the other person when he or she is having one of those bad times. And it means always remembering why you fell in love in the first place. So, here’s to the next ten years of marriage, and the next 20 after that. I can’t wait to see what adventures await us. Auguste Rodin said, "nothing is a waste of time if you use the experience wisely." Today, our adventures took us to St. Louis Children's Hospital where Grace had an appointment with her neurologist. 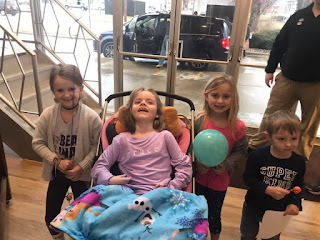 Over the winter, we had noticed Grace had been having some seizure-like activity, and we wanted to get it checked out. We just got a new neurologist last November, and we really liked her. But she was out on maternity leave until recently, so today was the day we got together. 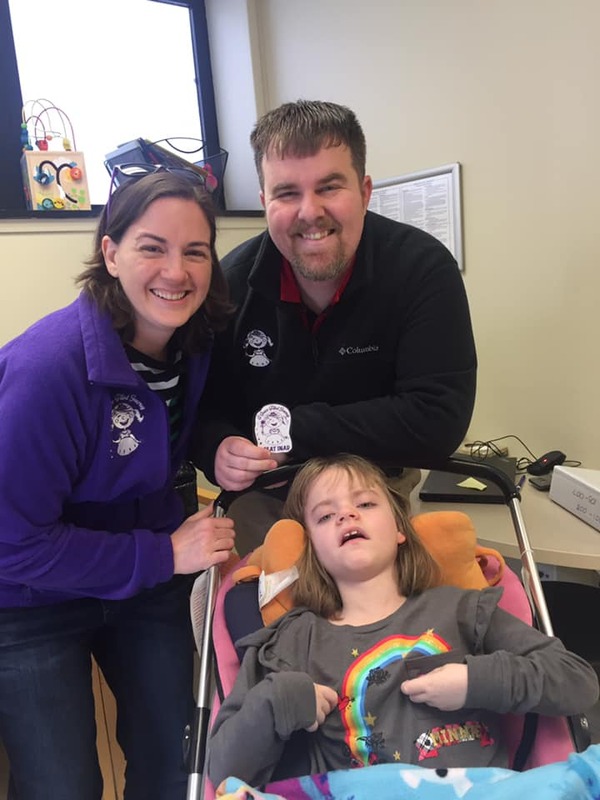 As part of the clinical trial, Grace had her first EEG done, and it showed some baseline seizure activity. 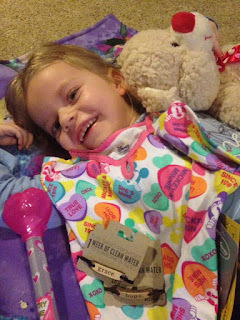 Grace's regular doctor suggested we start on a low dose of seizure medicine until we saw her neurologist, as a precaution for aspiration. 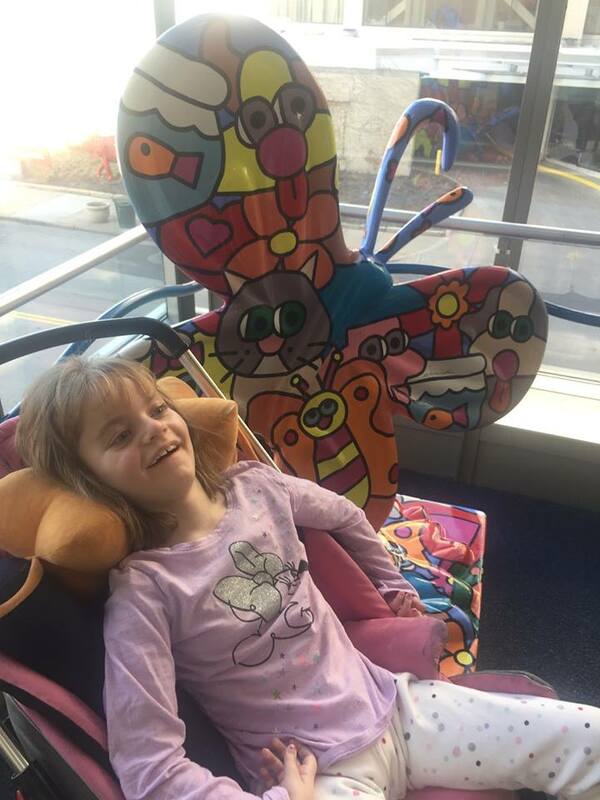 I have always loved this butterfly at Children's Hospital. Just reminds me of hope. At the appointment today, her neurologist suggested we continue the medication plan, and it gave us a chance to talk to her about the clinical trial. We feel so lucky to have her to bounce ideas off of, and she really understands the way we choose to help Grace live each and every day to the fullest. And because we like to make the most of our trips to St. Louis, we usually plan for something fun. Sometimes, we go to the St. Louis Zoo or the Magic House. 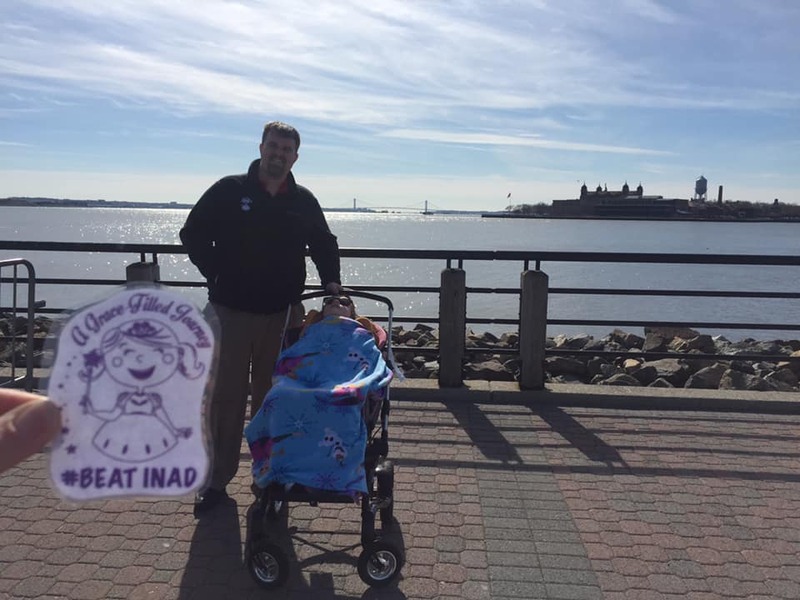 Other times, we stop by to see Dr. Kotzbauer for an INAD research update or Dr. Omurtag to show off how much Charlotte has grown! But today, was an extra special visit. Our friend Caleb is currently at the Siteman Cancer Center battling osteosarcoma, and we had a chance to stop by and visit with he and his awesome wife, Bethany, who works with us at the paper. It was such a good time chatting and laughing, and we continue to pray for a miracle as Caleb continues his battle against cancer. Delicious lunch at Pappy's Smokehouse. Then, we stopped at one of our favorite haunts for lunch. Although Grace Meat + Three is always one of our favorite stops, it's closed on Mondays. So, we picked Pappy's Smokehouse, and I got my usual BBQ Spud (with enough left over for lunch tomorrow). Everyone there is always so friendly and helpful, and there's plenty of room to feed Grace. So, while doctor's appointments can sometimes be a drag or just one more thing to do. We always try to make the most of our time together on this Grace-Filled Journey! 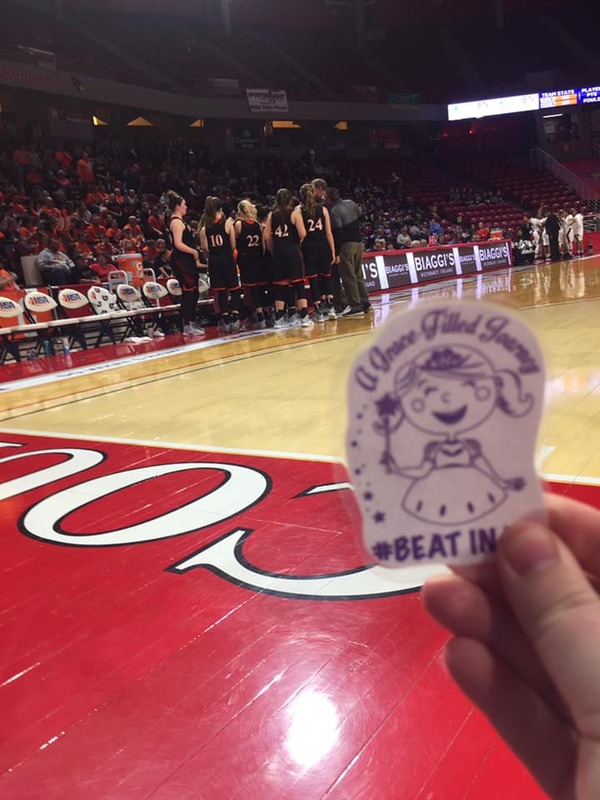 It was certainly a stately occasion that we found ourselves in Bloomington this weekend for the IHSA girls state basketball tournament. Grace sort of became an unofficial Lady Hiltopper in January 2015, when then seniors Keriann Cooper, Kelsey Traylor and Jaicie Halleman invited our family to their senior night game. That night, each of the basketball players wore purple gracelets and Grace was introduced as part of the team before the start of the game. Lunch at D'Arcy's Pub to start our adventure. 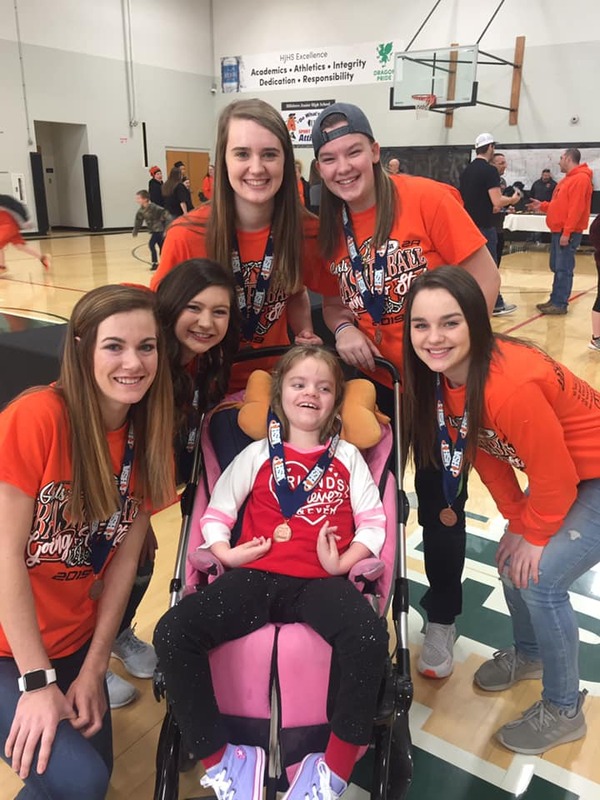 Ever since then, the Lady Toppers have kind of adopted Grace, inviting her to games, and making her feel very special. Two former Lady Toppers (Carly Cameron and Lindsey Storm) still keep in touch with us and meet us for ice cream when they are home from school. Resting up for the big game. So, it seemed only fitting that we follow this year's Lady Toppers to the state tournament in Bloomington. 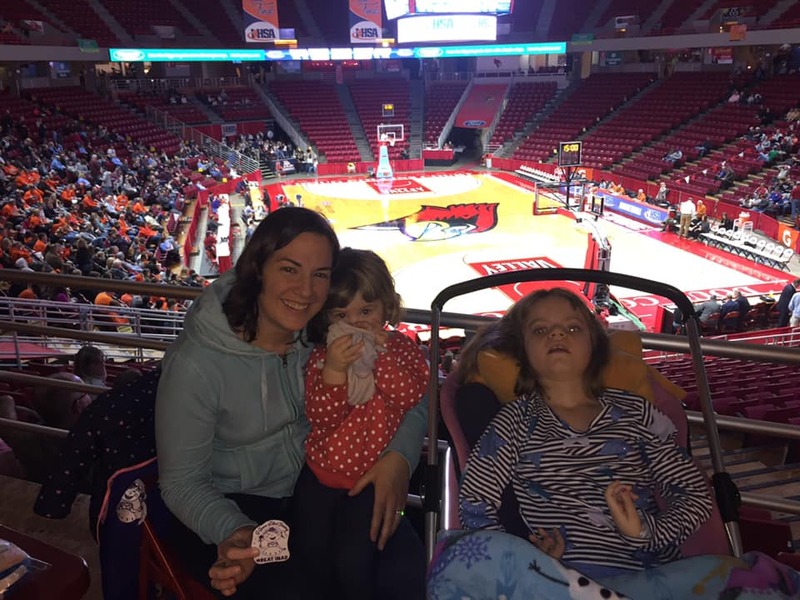 We only made it to a couple of regular season game this year, and Grace was sick with pneumonia in January, so we didn't get to take her to any of the postseason games. But thanks to live tweets from Kyle and Tim Mize on WSMI Radio, we were able to keep up with their winning ways. Hanging out at the semi-final state game. Kyle took this photo from the floor. As part of the clinical trial, Kyle and I were taking Grace to New Jersey when the Lady Toppers were winning their supersectional game and punching their ticket to state. We watched the first half of the game via Facebook live as we were sitting on the airplane waiting for the plane to take off. We had to wait until we landed to find out that they won! We flew back home the next day, and Kyle asked if the girls and I would accompany him to the state tourney. And we decided a family adventure was exactly what we needed! 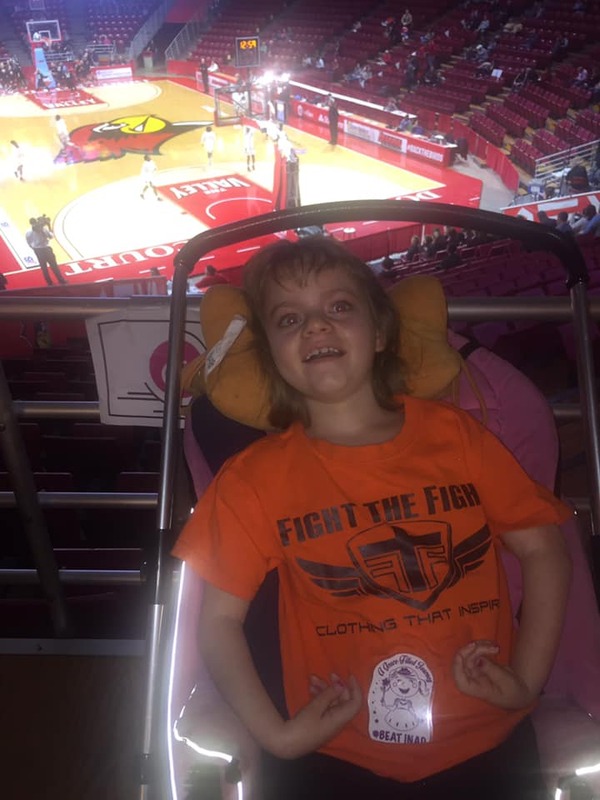 Grace has physical therapy in Springfield on Friday mornings, which is already halfway to Bloomington. So, we loaded up the van and took off. 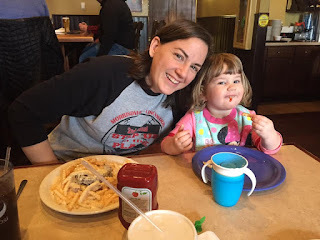 After a great session of physical therapy, we started our family adventure with lunch at D'Arcy's Pub for horseshoes. Because after all, all great adventures start with good food! Hanging out at the Discovery Children's Museum. Kyle booked us another fabulous room at the Hampton Inn in Bloomington, and we checked in so I could feed Grace and we let Charley run around the room for a bit. She sort of gets spoiled having Netflix at home and the chance to watch her favorite programs whenever she wants. She didn't quite understand why we couldn't just put Mickey on whenever she wanted. But it was cute to watch her. But before long, it was time to head to Redbird Arena to cheer for our favorite Lady Toppers. When we arrived, it was amazing to see the sea of orange and all the community members who came to watch. We found some accessible seats, which provided a place for Grace's chair, as well as space for Charley to have a little room to play. Some other Hillsboro fans joined us, and we had a great time visiting and watching the game. Although the Lady Toppers started off strong and led at halftime, they came up a little short in the end. But it was such a great game, and we were so proud of them! Just the girls hanging out at the third place state game! Good games call for good food, so we ordered pizza to take back to the hotel, and Charley kept repeating pizza all the way on the drive back. 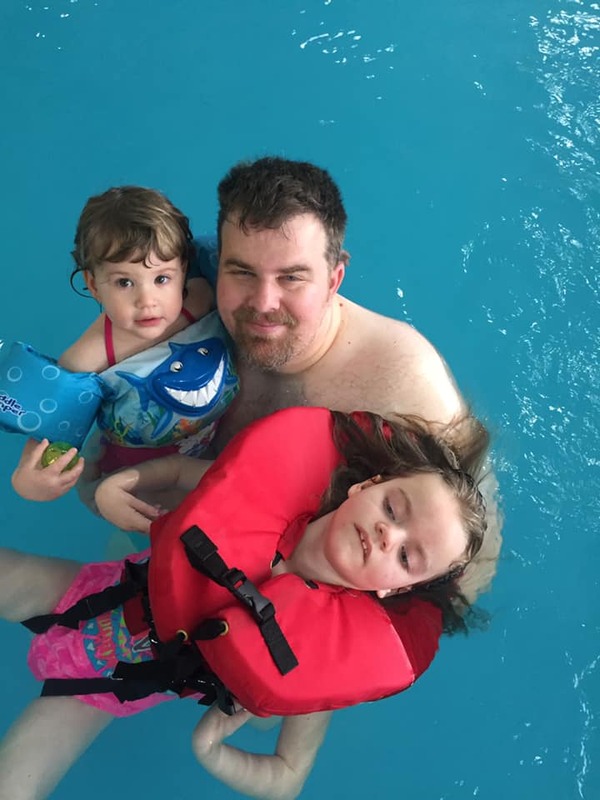 Even though Charley woke up bright and early, we took advantage of the opportunity to take the girls swimming and even to the Discovery Children's Museum before returning to Redbird Arena that night. 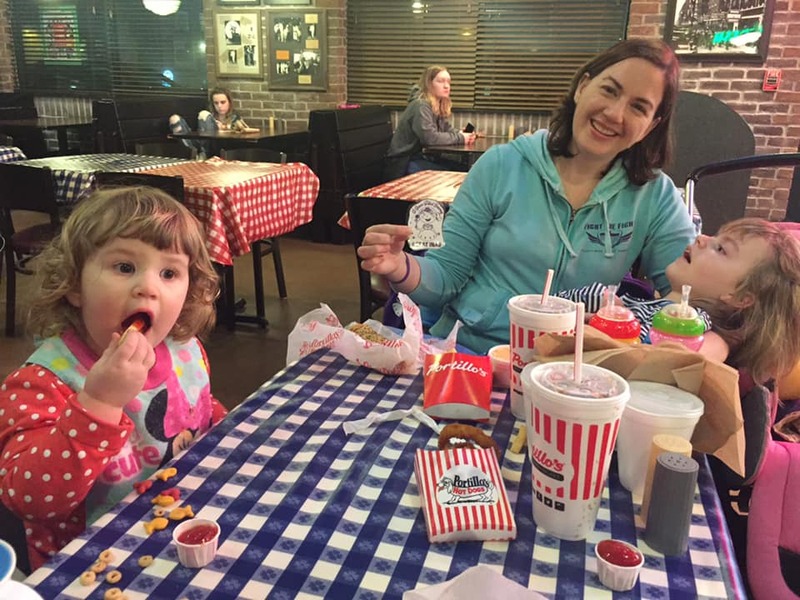 Dinner at the world-famous Portillo's before heading home. It was another fun night of popcorn, M&Ms and basketball. And even though this game didn't go the Lady Toppers' way either, they showed a lot of heart, and we are so proud of how far they made it. They were so much fun to watch this season and they finished fourth in state! We even enjoyed dinner at Portillo's before heading for home. To cap off our stately weekend, we took the girls to a welcome home rally for the Lady Toppers Sunday afternoon at the school. We loved seeing the community come together for the team, and were especially touched that senior Sheridan Lyerla thanked Kyle for bringing Grace to as many games as he could and called her a "spark plug" for the team. 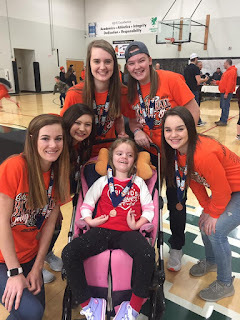 The five seniors even took time to pose with Grace for a photo and let her wear one of their state medals. I think Grace's smile showed how all of us were feeling. 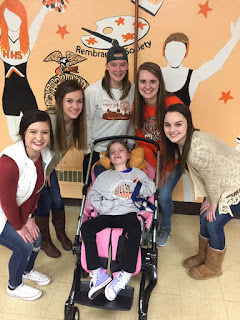 Grace was all smiles to meet the senior Lady Toppers at the game! We know there's a pretty good chance that Grace will probably never actually suit up for the Lady Toppers. If she got her "grace" from Kyle or I, there was a pretty good chance she wouldn't be very athletic even without a diagnosis of INAD. Even if she can't be an official part of the team someday, it's been pretty special to see the way the teams have embraced her and shared in our Grace-Filled Journey. After all, orange and black is where it's at . . . 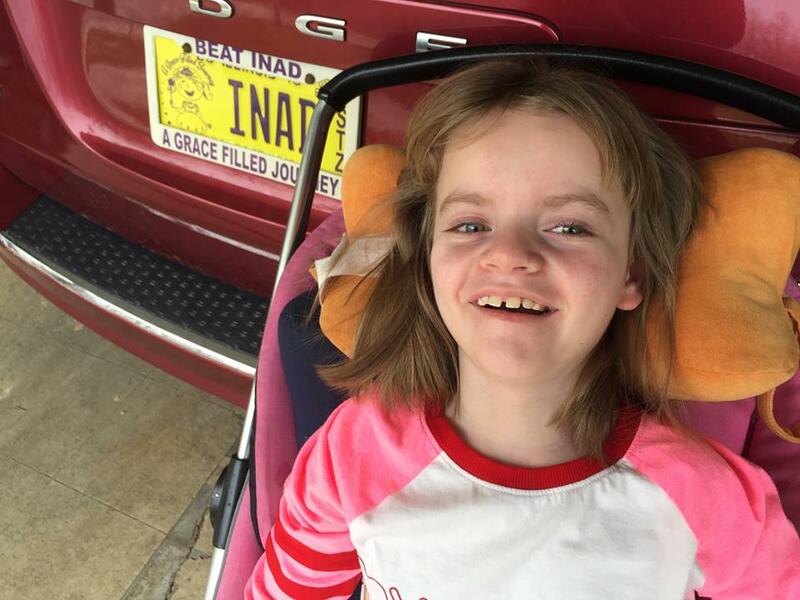 This week, the world lost another beautiful soul to the devastating disease of INAD. Landon Caputo passed away snuggling in the arms of his mother this week when he was just six years old. And while we know Landon is at peace now, we can't help but grieve for his passing. 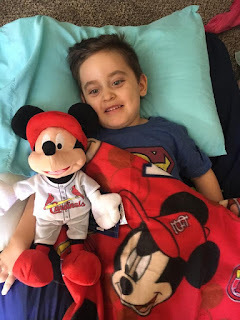 Grace sent Landon a St. Louis Cardinals Mickey Mouse for his collection. Although we never got to meet Landon, we got to know him through his mom's Facebook posts. 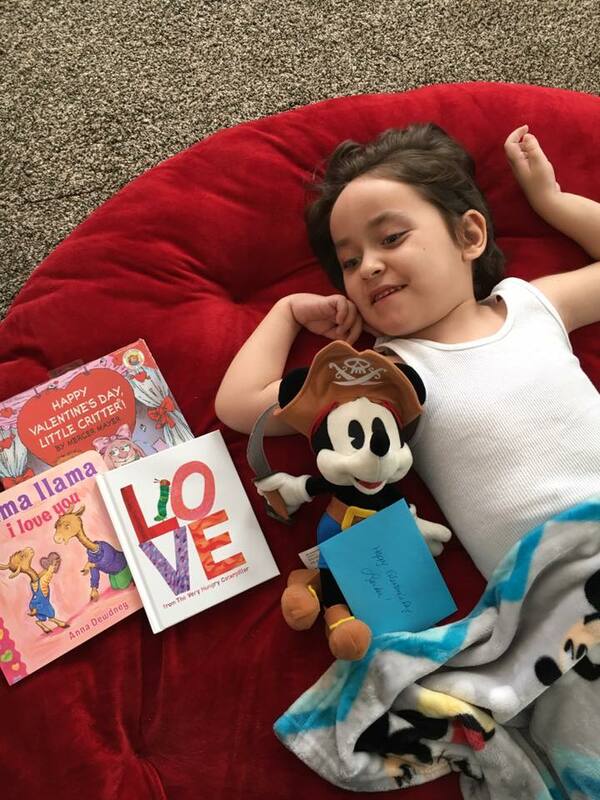 He was a little boy who loved Mickey Mouse, smiling and being with his family, including his big sister, Issy. He was so brave and courageous, just like all the kids who battle INAD. They never complain about the things life has taken from them. Instead, they smile and remind all of us to live each day to the fullest. Since Landon is just a little younger than Grace, he was diagnosed with INAD around the same time. And we got to know his parents through a support group on Facebook. Even though we have never met in person, I consider Landon's mom, Ashley a close friend. There's just something about sharing a life experience like this that bonds people together, whether or not they ever have the chance to meet in person. Landon sent Grace some Mickey pajamas for her birthday one year! Since Grace and Landon were about the same age, they have sort of gone through the progression of INAD at the same time. That has given Ashley and I a chance to bounce ideas off each other, check in on one another and share when things get hard. Ashley and I had been texting last week. She was looking in on Grace, asking us about how the trial was going. She shared that Landon had been having a rough time, and that they were spending his final few days together as a family. 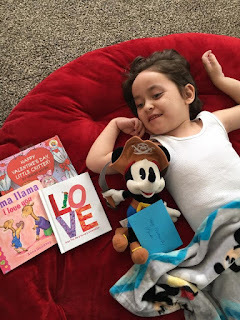 Grace also sent Landon a pirate Mickey Mouse for his collection. We are heartbroken for Landon's family. 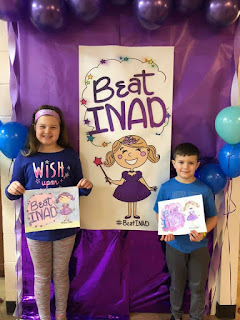 Instead of learning to write his name and read books in kindergarten, Landon bravely fought against a ravishing disease every day of his life. Strong and courageous, Landon's life is reminder to all of us that life is always to be celebrated. And we will never stop trying to #BeatINAD for Landon, Grace and all the brave kids who fight against INAD with ever fiber of their being. 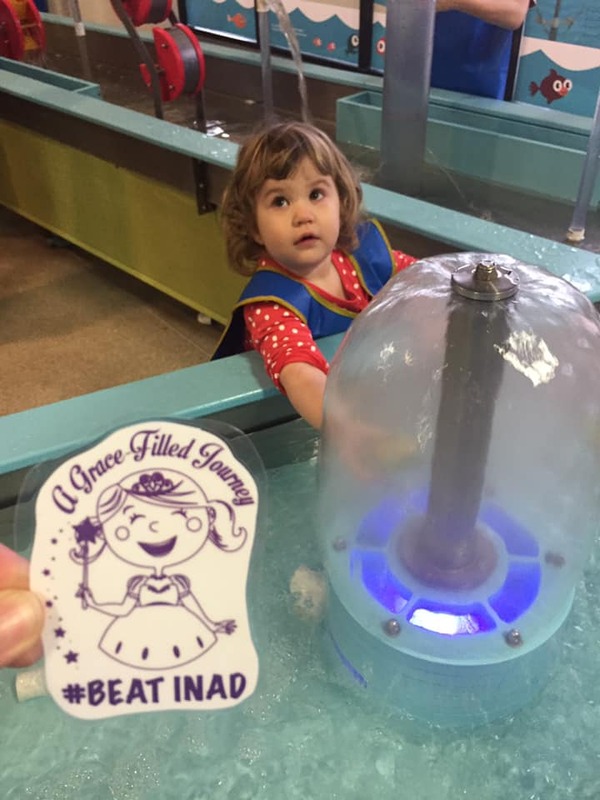 We will continue to raise awareness and funding for research until one day no kid has to fight INAD anymore. 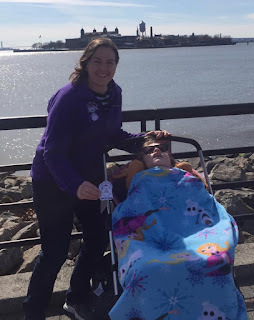 Just before we left, the director of the first-ever clinical trial said she thought we should take a picture with Grace of the momentous occasion that she tried her first does of RT001. And of course, that was right up our alley, so we grabbed Flat Gracie and posed for a photo. Getting ready to fly to New Jersey. In some ways, it marked the end of what seemed like very long journey. We first learned about Retrotope and their experimental drug, RT001, more than a year ago, when they published a press release online that there were two INAD patients taking the drug as part of a compassionate use program. The drug company has claimed that the drug is able to stop or at least slow the progression of INAD and can also help to reacquire lost skills. We immediately contacted the company, and discovered they were hoping to do a clinical trial for the drug in INAD patients, and that Grace would likely be a candidate. At the time, they told us the trial could start as early as March of next year. We learned that things like this often times take much longer than we would like. When it didn't start in March, we heard July or August, then October, and we got a call after the first of this year that Grace would be able to travel to New Jersey and participate in the clinical trial. Kyle and I have spent months and months debating whether or not to enroll Grace in the trial. At seven and a half years old, she's the oldest patient they have right now, and the cut-off age for participation is ten. We know this drug is not a cure, and that the positive effects we see may be minimal. But you never, ever know how something is going to play out, and we wanted Grace to have a chance to try this new drug. We also wanted to be able to further INAD research, and since we didn't feel the drug would have any harmful side effects to her, we finally decided to go for it. 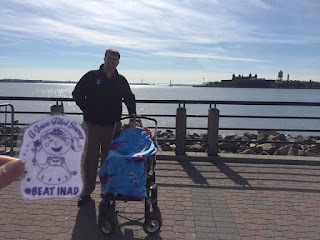 In January, we made a week long trek to New Jersey, driving the 13 hours and taking Grace to three days of baseline appointments. It was a long week for sure, but we learned a lot, and we are so grateful that Grace is a good traveler and we met lots of nice people. I think the hardest part of participating in the trial is that we had to return to New Jersey in two weeks to 45 days after those initial tests so Grace could have another baseline assessment and officially start the use of RT001. This visit was likely to last only part of a morning, so instead of driving the 900 miles, we opted to fly and do the trip in two days. Checking out the New York City skyline! We haven't flown with Grace in nearly a year and a half, and both of us were a little worried about how it would play out. Since Grace can't sit up or hold her head up, it makes it tricky to sit her in her own seat buckled up for the take off, and the last time we flew with her, the airline broke her medical stroller. But we pushed those worries aside (mostly), and decided it was the best decision since our trip was so short. And we couldn't be more pleased with the way everyone took care of us. When I texted that to Kyle's mom on the way home, she wrote back that Grace just seems to bring that out in people, and I couldn't agree more. We flew Southwest, where everyone took amazing care of us. From checking us in and setting us up for pre-boarding to making sure we had everything we needed, we were very comfortable on both flights. Grace was even able to sleep across my lap. We rented a minivan from Enterprise, which was also a wonderful experience and drove it to our favorite Hampton Inn in Denville, where the night clerk offered to say a special prayer for Grace during his morning devotional. We are continually blessed by so many that happen across our paths on this Grace-Filled Journey. 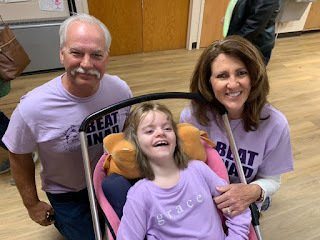 This morning, Grace had another baseline assessment, and they showed us how we can administer the drug to her each day. It's a little overwhelming. Clinical trials require a lot of data and record-keeping (and I can't say those things fall in my strong suit). But we are excited that she finally had a chance to try the drug that has helped some INAD kiddos. A view of Lady Liberty. I am SO proud of Grace for being part of this initial clinical trial. She has been so strong and brave through each and every exam, each and every assessment and even trying the medicine this morning. She never complains and always has a smile for everyone we encounter. She reminds us that life is always to be celebrated and to life each and every moment to the fullest. Oh, and that a smile can brighten everyone's day. Before we headed for home, we had a little time to kill before we got to the airport. 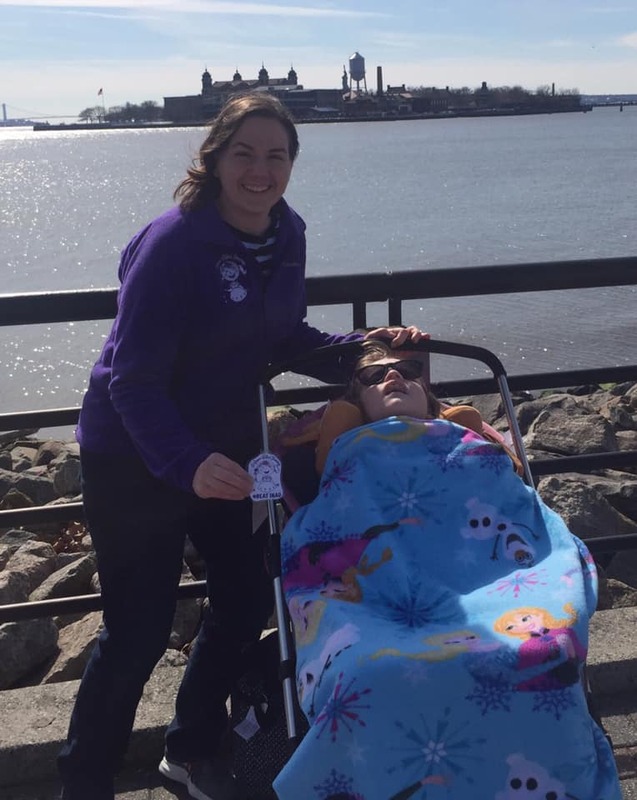 As he was driving, Kyle saw a sign for Liberty State Park with viewings of Ellis Island and the Statue of Liberty. How could we pass up an opportunity to take in such great sights? 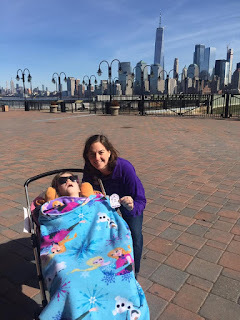 Although it was too cold to take Grace on a ferry ride to see the statue up close, we walked around and looked at the New York City skyline and stopped to see Lady Liberty. What better place to start a new adventure than at a place that marked one of the beginnings of our country. So, in a way, Grace getting to try the drug marked the end of a long journey, it also marked a new beginning. Over the course of the next year, we will continue to record when she takes the drug and any progress she makes along the way. We also have two more trips to New Jersey at the six-month mark and the one-year mark to assess any improvements or changes. Next time we go, we hope to take Charley with us and do a little sight-seeing in the area. 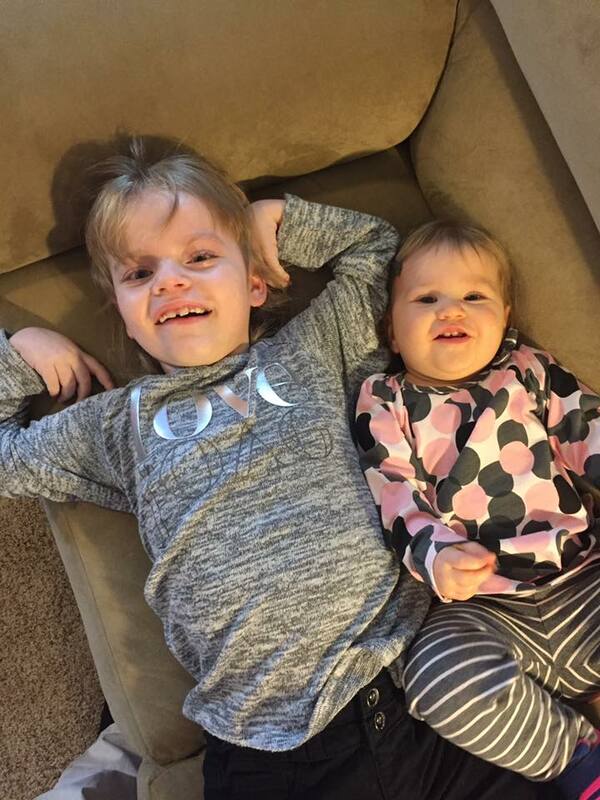 We won't know for awhile if RT001 will make any difference for Grace. Maybe it helps her a little, and maybe it doesn't. But we know that it's a chance we took to give Grace every single chance there is. And we are SO grateful to each and every person who helped us along the way on this amazing Grace-Filled Journey. The day before her second birthday, Charlotte came into our bedroom first thing in the morning, all by herself. It was the first day she had figured out how to crawl out of her crib, and after startling me at first, it was cute to see her so proud of her accomplishment. Today, Charlotte Grace Herschelman turns two years old, and it's been immensely fun to watch her accomplish so many things. From her first "da da" to picking out all the characters on the Mickey Mouse Clubhouse, we have loved listening to her learn how to talk. Kyle's favorites are "snicky" instead of "stinky" and "Goosey" instead of "Goofy." I told Kyle that one day I will miss trying to figure out all the things she is trying to say! She's also mastered so many other skills in her first two years, walking and then running, picking out her favorite toys to play with and giving hugs and kisses. Most of the time, Kyle and I just sit and watch her play, in awe of all the things she learns each and every day. In some ways, as excited as we are that Charlotte is meeting all these milestones, it's a bit bittersweet at times. Charlotte has already far surpassed any of the skills Grace ever had when she was younger. Grace had a handful of words (my favorite was always "ma ma") and she knew all her animal sounds. She was able to cruise the furniture for a time and walk in a reverse walker, but she was never able to walk on her own. And that's just the tip of the iceberg. INAD has stolen so many things from her that she's not even able to sit up on her own anymore. But INAD hasn't stolen her ability to smile, and when she smiles at Charlotte, it seems that my world is complete. I never had a sister, but I have always heard about the special bond between sisters. 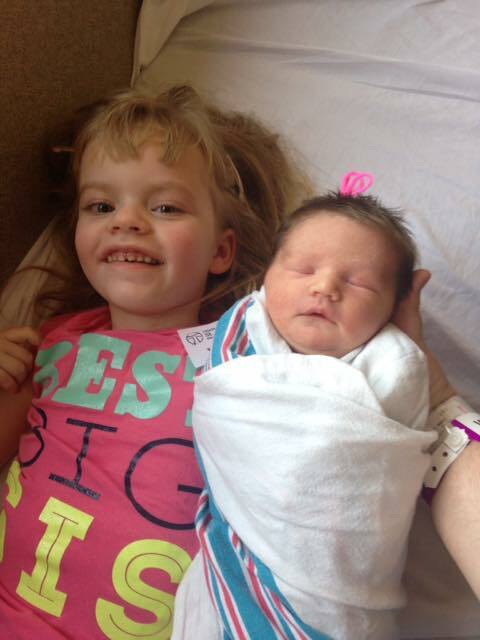 And it would seem that Charlotte and Grace have formed that bond already. 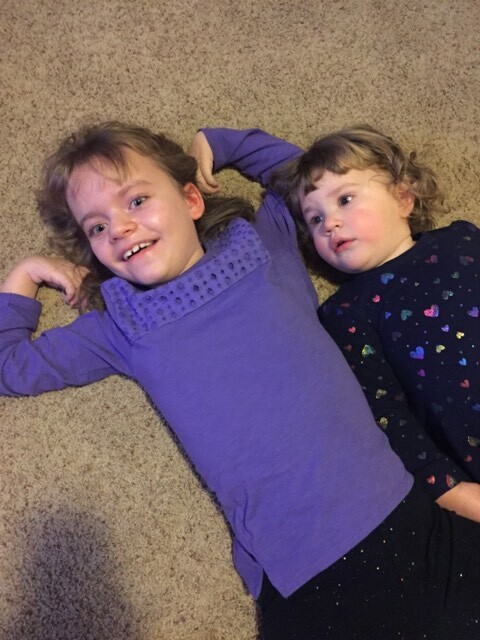 Just yesterday, Charlotte crawled up on top of Grace just to give her a hug and a kiss. It was about the sweetest thing. Charlotte loves talking to Grace, and in true big sister fashion, Grace laughs anytime Charlotte gets scolded for something. That little bit of normalcy never ceases to make me smile. Accepting that Grace has INAD means accepting that our dreams for Grace's future have changed. When Grace was a baby, we wondered what she would like to do when she got bigger. She always loved playing with soccer balls, and we thought she might like sports. We wondered if she would like school or become a writer someday like Kyle and I. Sometimes it's hard to accept when dreams change, but we also know that Grace has already made a huge impact in the world. The birth of Charlotte two years ago brought up all those same types of questions. We wondered what she will be like someday. Will she be the head of her class or the star of the basketball team? Will she want to join 4H or Girl Scouts? If the past two years are any indication of her determination and perseverance, I would say Charlotte will be able to do anything she puts her mind to. And I'm okay with that. I've also seen her compassion and empathy for her sister, and it's my hope that whatever she decides to do in this world someday, that she does it with kindness. That would be my greatest dream for her. The past two years have flown by so quickly, and it seems like Charlotte has already been part of our family forever. We continue to be blessed by her spunky attitude and caring heart. We can't wait to see what the future holds for her.